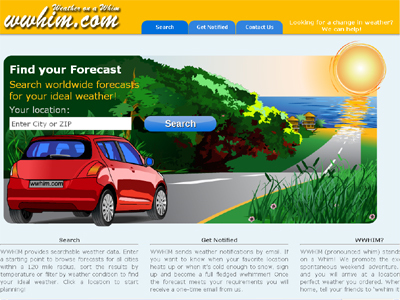 WWHIM (pronounced whim) is an informative website that provides weather information in an interactive and easy interface. Visitors can sort weather forecasts within a user defined radius from hot to cold or filter weather conditions to only see the weather they desire. When a destination is selected, useful links to travel planning sites are provided. WWHIM also provides weather notifications for users who wish to be notified when their favorite location reaches a user-defined temperature. WWHIM caters to a variety of travel enthusiasts including couples, families, the retired RV’ers and college students. What sets WWHIM apart from other weather websites is the interactive searching and filtering capabilities. Competitors only allow a user to search the weather at a desired location, where WWHIM takes the approach in reverse – searching for a location with a desired weather. Users can sort, refine and filter their weather search in several ways, allowing for a fresh approach to travel planning – letting the weather forecast be the guide.